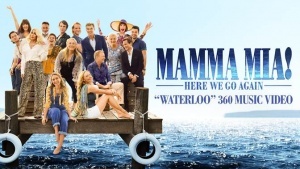 Universal City, CA, June 14, 2018—Universal Pictures today released a 360-degree music video for “Waterloo,” from the upcoming musical comedy MAMMA MIA! HERE WE GO AGAIN, in theaters July 20. The “Waterloo” 360 Music Video is now available to view on Facebook 360, YouTube 360 and Oculus Go. The energetic musical performance showcases the moment where the series irrepressible Donna Sheridan first meets Harry Bright, one of her daughter’s three possible dads. A uniquely staged and choreographed experience that takes full advantage of 360-degree storytelling, the stunning video features more than 40 dancers in a seamless sequence. Set in 1979 in a vibrant Parisian café, the story sweeps the viewer into the scene as they transform into Young Donna, who is wooed by Young Harry with a timeless song. The song, performed in the film by Hugh Skinner and Lily James, is now available as an instant download track when fans pre-order the MAMMA MIA! HERE WE GO AGAIN Movie Soundtrack, available on July 13. The cinematic virtual-reality experience was created by Wevr and Universal, choreographed by Anthony Van Laast and features Skinner, alongside fellow co-stars Jeremy Irvine, Josh Dylan, Alexa Davies and Jessica Keenan Wynn.